Friday is here! The race is on to find the secret of the Middle House. The fifth eagerly awaited installment in Garth Nix's best selling fantasy series,The Keys to the Kingdom. Four of the seven Trustees have been defeated and their Keys taken, but for Arthur, the week is still getting worse. Suzy Blue and Fred Initial Numbers Gold have been captured by the Piper, and his New Nithling army still controls most of the Great Maze. Superior Saturday is causing trouble wherever she can, including turning off all the elevators in the House and blocking the Front Door. Arthur can't even find out what is happening back home. All he knows is that Leaf isn't on earth any more. She's missing and so are hundreds of other people who were transferred from regular hospitals to a private institution run by a 'Doctor Friday'. From there they have been taken somewhere else in the Secondary Realms, for Lady Friday's own horrible purposes. Amid all this trouble, Arthur's mother is also missing, and he must weigh up an offer from Lady Friday that is either a cunning trap for the Rightful Heir or a golden opportunity he must seize - before Superior Saturday or the Piper beats him to it. 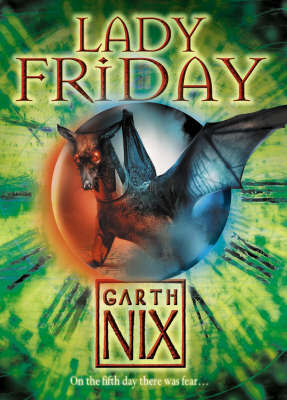 Garth Nix was born in 1963 and grew up in Canberra, Australia. After taking his degree in professional writing from the University of Canberra, he worked in a bookshop and then moved to Sydney. There he sank lower into the morass of the publishing industry, steadily devolving from sales rep through publicist until in 1991 he became a senior editor with a major multinational publisher. After a period travelling in Eastern Europe, the Middle East and Asia in 1993, he left publishing to work as a marketing communications consultant . In 1999 he was lured back to the publishing world to become a part-time literary agent. He now lives in Sydney, a five-minute walk from Coogee Beach, with his wife, Anna, and lots of books.